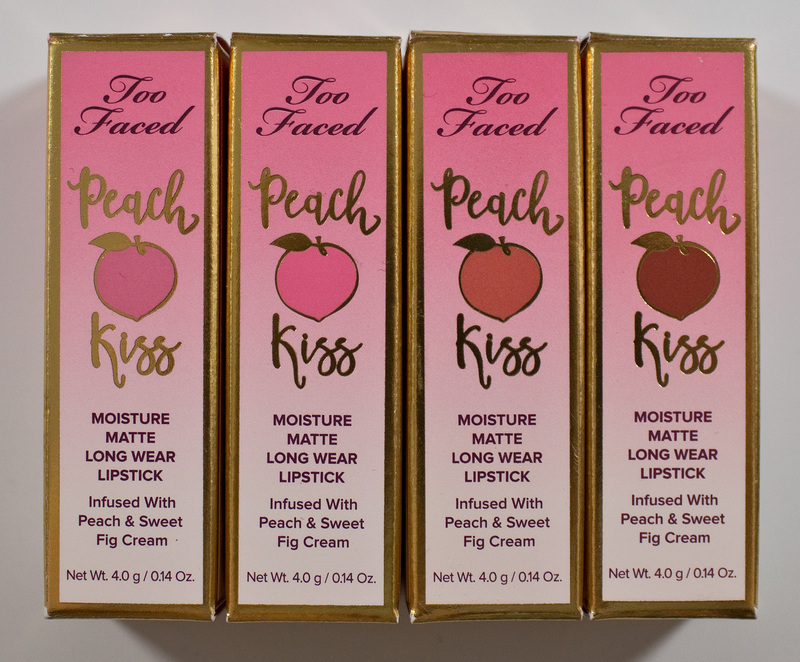 Too Faced Peach Kiss Moisture Matte Long Wear Lipstick in Make Me Blush, Makeup Me Happy, Peach Beach, & Got Peach? 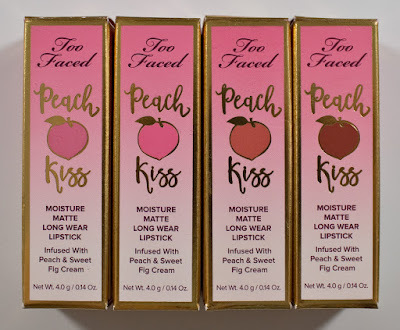 The Too Faced Peach Kiss Moisture Matte Long Wear Lipstick retail for $21US and $25CAN for 0.14 oz/ 4g of product each. 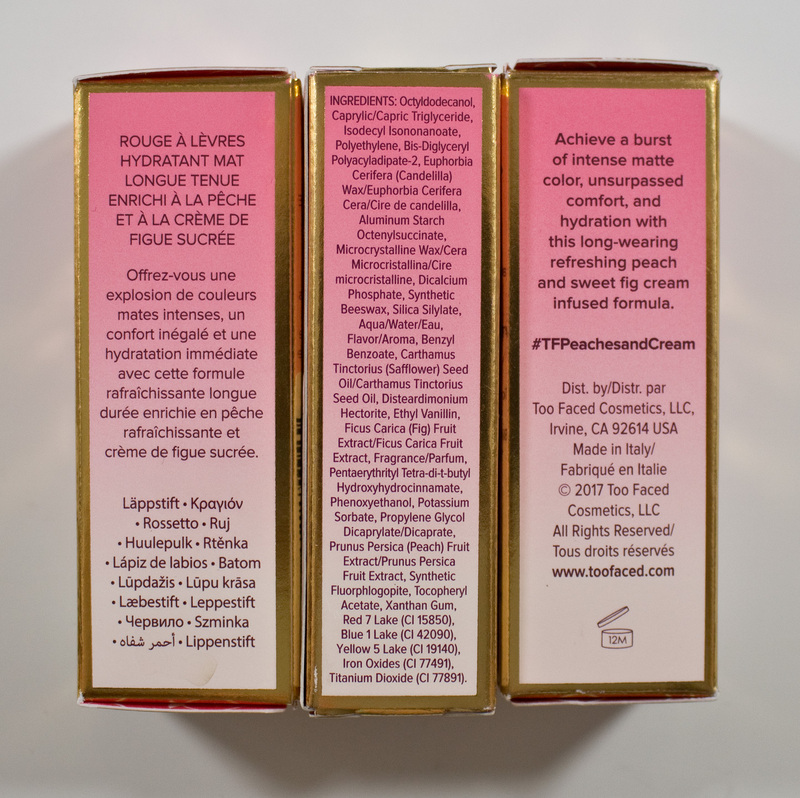 I did get 3 of these shades deeply discounted at Marchells as Too Faced changed their tube packaging for the line. Too Faced Peach Kiss Moisture Matte Long Wear Lipstick tube. 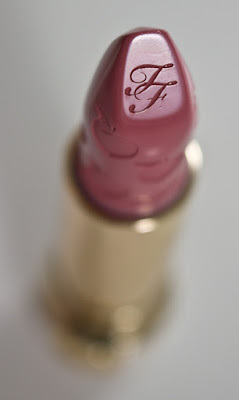 Too Faced Peach Kiss Moisture Matte Long Wear Lipstick in Make Me Blush, Too Faced letter mark logo on the tip. 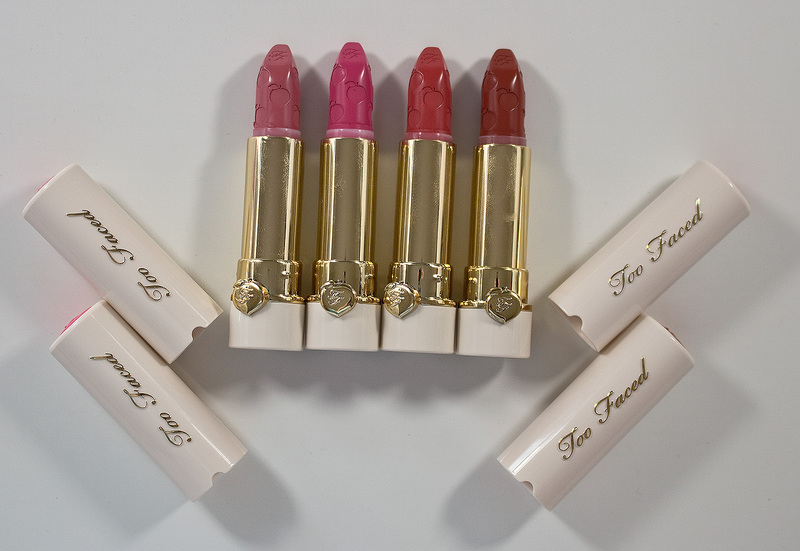 Too Faced Peach Kiss Moisture Matte Long Wear Lipstick in Make Me Blush, Peach logos in the side of the lipsticks. 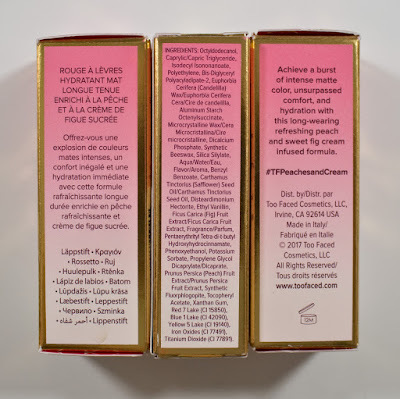 Octyldodecanol, Caprylic/Capric Triglyceride, Isodecyl Isononanoate, Polyethylene, Euphorbia Cerifera (Candelilla) Wax, Bis-Diglyceryl Polyacyladipate-2, Synthetic Fluorphlogopite, Aluminum Starch Octenylsuccinate, Microcrystalline Wax, Synthetic Beeswax, Silica Silylate, Water, Flavor/Aroma, Benzyl Benzoate, Carthamus Tinctorius (Safflower) Seed Oil/Carthamus Tinctorius Seed Oil, Dicalcium Phosphate, Disteardimonium Hectorite, Ethyl Vanillin, Ficus Carica (Fig) Fruit Extract/Ficus Carica Fruit Extract, Fragrance, Pentaerythrityl Tetra-Di-T-Butyl Hydroxyhydrocinnamate, Phenoxyethanol, Potassium Sorbate, Propylene Glycol Dicaprylate/Dicaprate, Prunus Persica (Peach) Fruit Extract/Prunus Persica Fruit Extract, Tocopheryl Acetate, Xanthan Gum. Red 7 (Ci 15850), Yellow 5 Lake (Ci 19140), Blue 1 Lake (Ci 42090), Iron Oxides (Ci 77491, Ci 77492), Titanium Dioxide (Ci 77891). The Too Faced Peach Kiss Moisture Matte Long Wear Lipstick formula that has excellent colour coverage but is still creamy to apply. These do have a sweet vanilla fig scent that smells like food. Make Me Blush is warm pink with a cream finish. Makeup Me Happy is a bright pink with a cream finish. 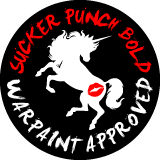 Peach Beach is a hot coral with a cream finish. Got Peach? is an orange terracotta with a cream finish. 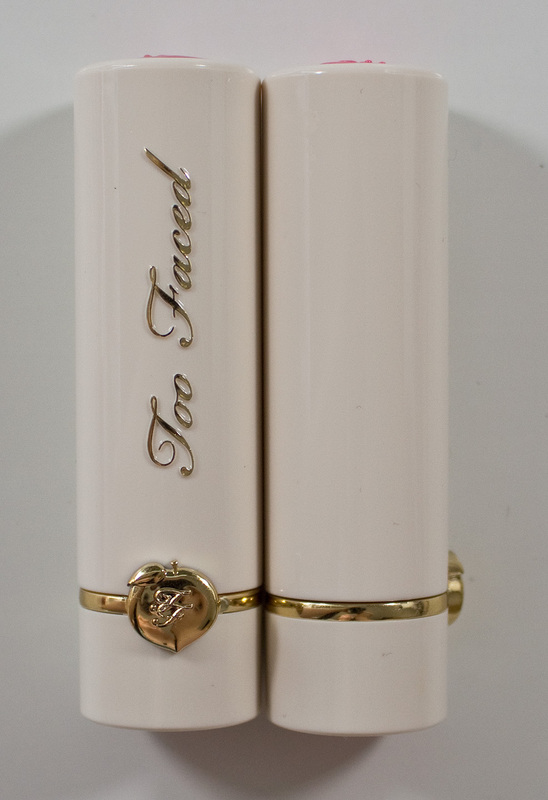 Packaging: Is an around lipstick tube with a gold peach shape closure and gold too faced logo on the tube. 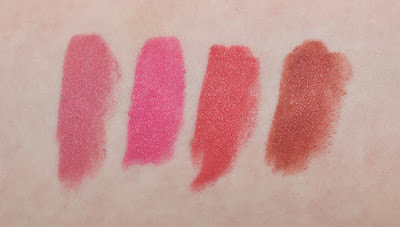 Daylight Swatches: Make Me Blush, Makeup Me Happy, Peach Beach, & Got Peach? Flash Swatches: Make Me Blush, Makeup Me Happy, Peach Beach, & Got Peach? 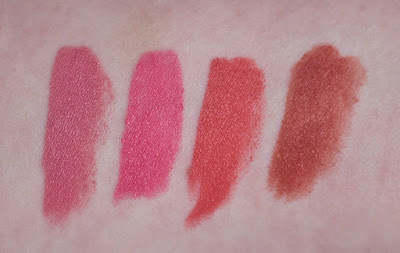 This formula is actually really nice while wearing these as they are a matte looking formula that is still creamy feeling on the lips.